Salt might not be the first thing that pops in your mind when you think of amazing beauty DIYs. Sure, we love our salty snacks: potato chips, nachos and French fries – but too much salt often leads to bloating, and whole lot of other health issues. Still, just because too much salt isn’t good for the health doesn’t mean that it won’t be able to wonders when incorporated in our beauty routine. Don’t believe us? 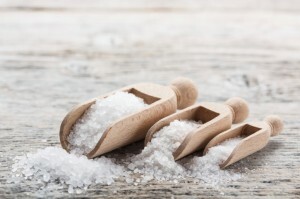 Then read on to discover the amazing benefits that salt can do to your hair, skin and lips. 1. Fights Acne Breakout. Prone to having acne breakouts? Then it might be time to add a little salt into your beauty routine. All you’ve got to do is combine ¼ teaspoon of salt with a cup of warm water, soak a gauze pad or cotton ball, and gently press it over affected area. The salt solution will aid in reducing redness and swelling of your acne, thus speeding up its healing process. 2. Releases Toxins. Apart from adding flavour to our meals, salt can also help our body release some toxins. Through dry salt therapy, salt particles are dispersed into the air and are then absorbed by the skin to release toxin build-ups from the surface layer and replenish the moisture that was lost in the deeper layer. 3. Softens Skin. Another amazing benefit of adding salt into your beauty routine is that it helps in softening the skin and reducing the appearance of wrinkles. Other than that, salt can also be used to slough off dead skin cells without over-drying the skin. If you want, you can make a body scrub using salt and olive oil with some drops of essential oil to soften and refresh your skin. 4. Treats Minor Foot Infections. Getting minor infections from crummy pedicures isn’t something new – and luckily, you can now treat these infections using salt and warm water solution. All you’ve got to do is fill a shallow basin with warm water, add a cup of salt and soak your infected foot for half an hour. Do this twice a day until the infection is gone and is already starting to heal. 5. Chapped Lips. For most of us, colder months translate to dry, chapped lips. A simple way to treat this is to mix two to three tablespoons of Epsom salt with a tablespoon of Vaseline and gently massage the mixture into your lips to get rid of dead skin cells. Once you’re done, slather a deep moisturizing balm and voila! Your lips is already in perfect condition for a swipe of lipstick. Although it’s commonly used in the kitchen, adding a pinch of salt in our beauty routine is already enough to up your beauty routine and even solve some of your major beauty woes.